Hare Krishna!! Lord Vishnu is considered as operator of the world and your Tour to Puri is a religious journey to home of Lord Jagannath (incarnation of lord Vishnu). Along with you will also get a chance to see the masterpiece of architecture - Sun Temple of Konark. It's our pleasure to Welcome you in incredible India. Representative of Plan Our Travel's will warmly welcome to the country with heartfelt hospitality at the airport. Then, transfer to the hotel. On the arrival at hotel, check-in and after freshen up proceeds to visit Bhubaneswar - The Temple City of India .Visit the Lingaraj Temple , Mukteswar , Parsurameswar , Rajarani , Ram Mandir Temple . Later explore the Jain caves at Khandagiri and Udaygiri. Morning after breakfast leave for Puri, en route visit Ashokan rock edicts at Dhauli and Pipli applique village. On arrival Puri check into the hotel. 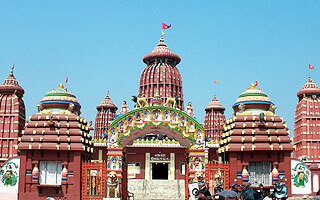 After freshen up visit the Lord Jagannath Temple in Puri and explore the local bazaars. Morning after breakfast proceeds for the excursion of Konark Sun Temple - 45kms/45mins drive each way. Konark Sun temple is masterpiece of architecture, you will surely going to be lost in the beautiful carving on stone and its design. After visit drive back to Puri. Overnight stay at hotel in Puri. Morning after breakfast proceeds for an excursion to Satpada Chilka Lake to see the Irrawady dolphins / birds -65kms/2hrs drive each way . Morning after breakfast drive towards the Bhuvneshwar airport to catch flight for your hometown. Here your tour ends and sure that you enjoyed the tour lavishly. Happy fly!! !